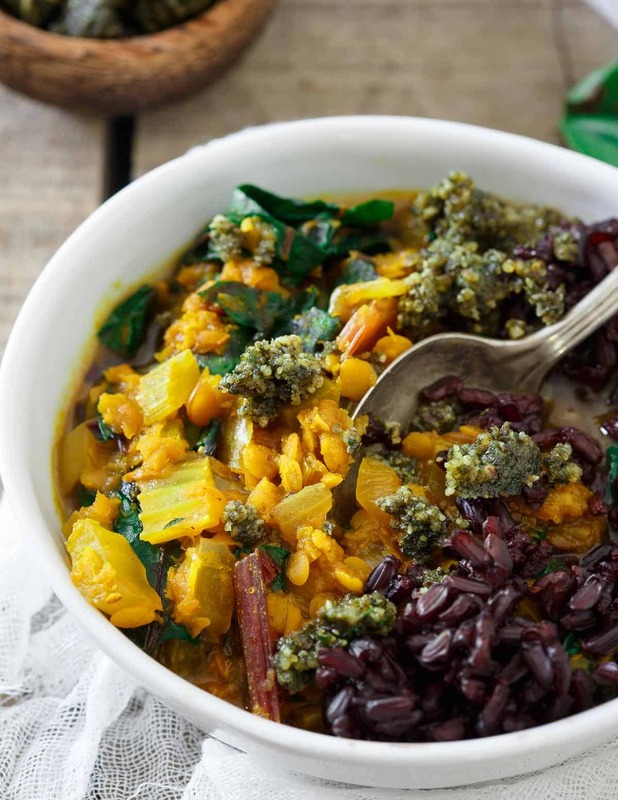 This turmeric lentil stew can be served with any grain you’d like for a hearty, health packed, comforting vegetarian meal. 14 years ago, I found myself in sketchiest of all hotels I’ve ever stayed at in my life in Marrakech, Morocco. 10 or so of us from college decided we wanted to explore Africa since we were living so close to it just across the Strait of Gibraltar in Spain for the semester so we enlisted Manolo, our program director’s guitar playing, long grey-haired boyfriend to take us. After a ferry ride, a super scary border crossing requiring men with assault rifles boarding our bus and taking all our passports for 45 minutes before giving us the ok to continue on and a few hour drive into the Moroccan countryside, we finally arrived at our hotel in Marrakech. I seem to have blocked out a lot of the details of that hotel but I do remember it being freezing cold inside and the shower being so disgusting we laid a towel down in it to stand on while showering (in the cold water). The next morning we visited the Koutoubia Mosque, experienced our first public African restroom (a hole in the ground) and ended at the most insane marketplace I’ve ever been to in my life. I don’t remember what it was called but the size of it was beyond overwhelming. From snake charmers to vendors selling anything and everything you can imagine to all sorts of exotic fresh produce and spices, this market had it all. Including monkeys, donkeys and lots of other furry animals in every direction you looked making my incredibly allergic self a miserable mess. At one point, with a tissue shoved up my nose, we wandered into a spice store. Imagine Sephora but with spices. That’s what this place was like. SO.MANY.OPTIONS. When I walk into Sephora, I’m a complete lost soul. That’s sort of how I felt in this store. Sure, they had the regular ones but there were equally as many I’d never heard of filling the air with their amazing aromatics. The owner eventually came out and gave us a quick lesson in Moroccan/Middle Eastern “go-to” spices and cooking. I don’t remember it all, but I do remember it being the first time I learned of all the touted health benefits of turmeric. 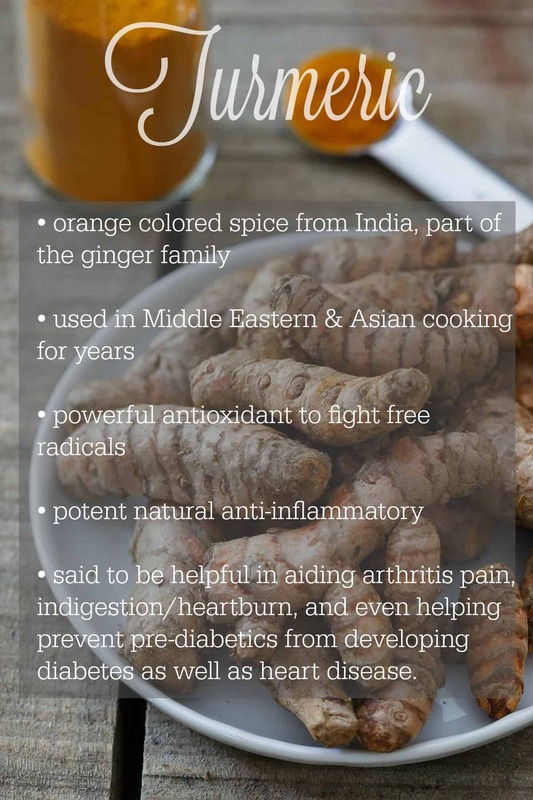 Who would’ve though this nubby looking thing that resembles ginger has been used for ages as a natural source to heal all sorts of different ailments from arthritis to diabetes to inflammation? I ended up bringing home 5 bags of spices from that store but neglected to put labels on any of them. By the time I returned home to the states after the semester abroad was over, I couldn’t remember which spice was which except for the turmeric. With it’s striking bright orange color, it made itself known and from that point forward it’s been a staple in my cooking repertoire. 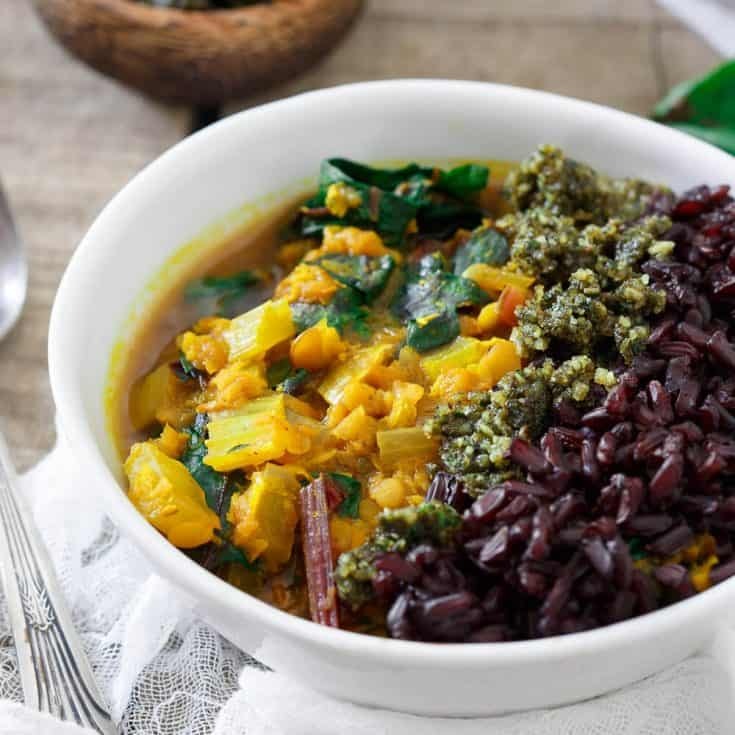 This turmeric lentil stew (which a few of you maybe saw me make on the Udi’s Snapchat last week) is a comforting vegetarian meal (just like this lentil vegetable soup recipe) made even heartier by the addition of a grain of your choice. It’s shown here with black rice but any grain will do. Cook the grain separately from the stew (this way it doesn’t get all mushy in leftovers) and just spoon it into the serving bowl with the stew upon serving. Farro, freekah, barley and wheatberries, although not gluten-free, would be excellent options as well. The turmeric not only gives the stew this lovely, earthy fragrance and taste, it might just help with your health too! For more recipes using turmeric, try this creamy skillet turmeric chicken, this baked turmeric oatmeal or turmeric chicken salad. 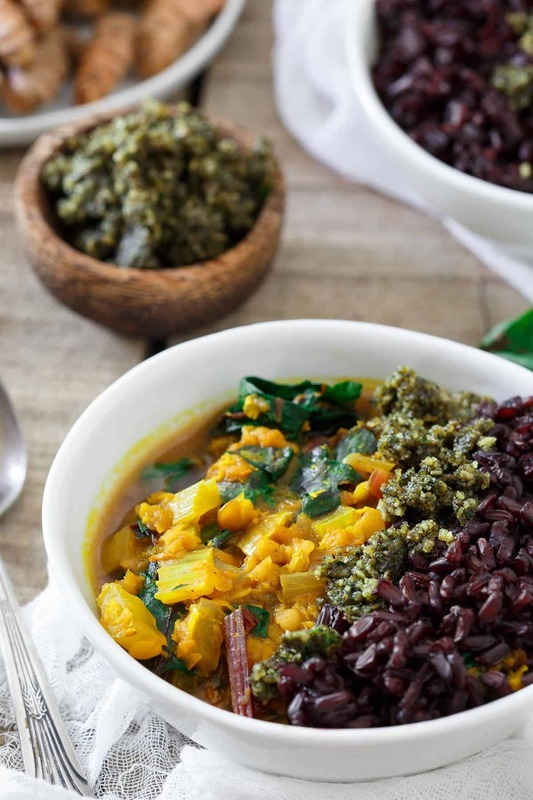 This turmeric lentil stew can be served with any grain you'd like for a hearty, health packed, comforting vegetarian meal. Add the olive oil to a large pot over medium-high heat. Once hot, add the onions, celery and carrots and cook until softened, about 5 minutes. Add the turmeric, cumin, salt and pepper, stir and cook another minute until fragrant. Add the broth to the pot, stir then add the lentils. Bring to a boil then reduce heat to low and simmer for about 20 minutes. While stew cooks, make the pistou by combining all the ingredients except the olive oil in a food processor. Process until finely chopped. With the processor running, slowly drizzle in the olive oil until the mixture just comes together in a clumpy texture. Set aside. Once lentils are tender, add the chard to the pot, stir and cook another 5 minutes until stems are softened and leaves are wilted. Season to taste with salt and pepper. To serve, spoon grain of choice into serving bowl, ladle the stew on top and garnish with the pistou. Dear Gina, what an amazing story!!! I’m so glad you made it back alive to tell it. Seriously, only in college. These days I would be a wreck, my heart in my throat, wondering if I would ever see my children again. Loved learning more about turmeric today, I don’t have a lot of experience cooking with it. 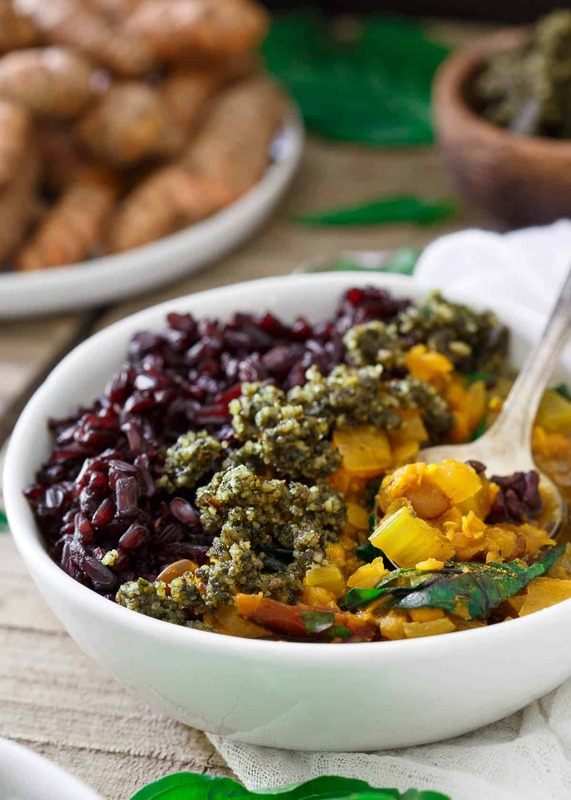 This will be a great recipe to try, I’m a fan of anything with lentils! Loved seeing this on the Udi’s snap feed!! I want this right now for lunch!! Girl, Sephora is one of my favorite places ever. I think I’d dig a spice Sephora too though. This recipe sounds super good and totally reminds me of dish that is served at my favorite Mediterranean restaurant. I’m so hopeless in that store, teach me your ways! Loved reading your story! I’ve dreamed of the spice markets in Morocco- but haven’t gotten there yet! I can almost smell this stew, so colorful! I’m a huge turmeric fan and can’t wait to try this one. I would devour this. And what? You went to Africa? That’s amazing. I’ve been thinking about planning a trip to Cape Town, because SUN… also Cheetahs. Turmeric is the bomb. So making this! Soooo jealous. I would love to travel! I would also love a big bowl of this stew right now! I love this story! I studied abroad too and had a pretty nasty shower experience in a hostel in London – I wish I had thought to put a towel on the floor. I am a huge lentil fan this recipe sounds wonderful. There is a reason why some of the Asian countries do not have nursing home. Because they consume turmeric in all of their dishes. I love the fresh tubers, I grate them or use the powder all the time. It improves memory & the mind. I cannot wait to try this recipe. Thank you.